These DRC La Tâche 1949s sat in Robert Drouhin's cellar for more than 60 years. An extraordinarily rare collection of wines will be hitting the auction block at Sotheby's next week. The wines come from Burgundy's Domaine de la Romanée-Conti, arguably the most highly sought wine label in the world. The bottles, from vintages spanning 1937 to 1964, come mostly from DRC's three most coveted vineyard holdings: La Tâche, Richebourg and Romanée-Conti. And the provenance is impeccable: For the past half-century or more, the wines have been resting in the personal cellar of Robert Drouhin, who ran the Burgundy house Maison Joseph Drouhin from 1957 until his retirement in 2003. The Oct. 13 sale in New York will comprise 100 lots, 91 of which feature Domaine de la Romanée-Conti, representing 219 bottles, plus 7 magnums. The remaining nine lots are rarities from Drouhin's production, including 1962 Griotte-Chambertin and Bonnes Mares, 1959 Clos de la Roche and 1961 Musigny. The Drouhin family was closely tied with Domaine de la Romanée-Conti for a time, beginning during the Great Depression. With Burgundy sales difficult, Robert Drouhin's father, Maurice, decided to focus on quality. He established good relations with DRC, and Drouhin became the distributor for DRC's wines from the 1930s until 1964. Most of the wines during that period were bottled at the domaine. However, there was a period between 1939 and 1941 when the wines were purchased by Maurice in barrel and bottled in Drouhin's cellar, according to Robert. "I do not know all the details," he says. When I asked Robert, who was honored with Wine Spectator's Distinguished Service Award in 2013, why he decided to sell, he told me, "I would think Burgundy lovers will be pleased to have access to some of the best and rarest wines of our estate which I had selected years ago for my pleasure, and testimony of my first years heading Joseph Drouhin." This is not his entire personal collection of DRC wines. Drouhin, 85, wisely held some back for family and friends, especially, he says "for the education of my grandchildren [who are] now in their twenties; they will be fascinated with these exceptional wines!" 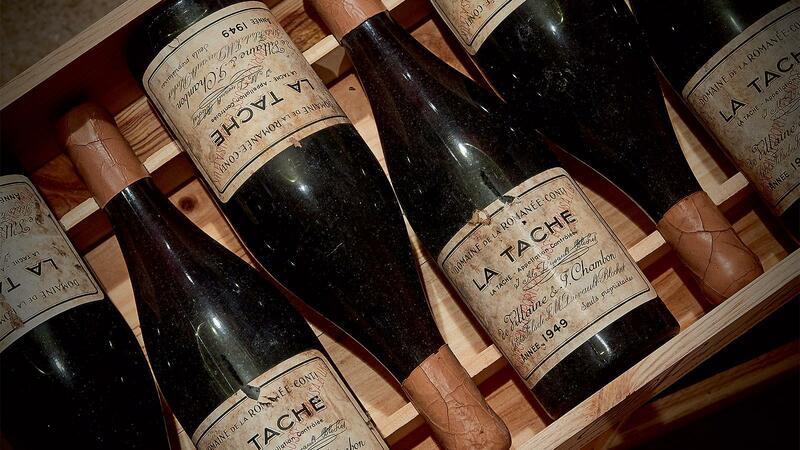 I have had the good fortune to taste mature vintages of La Tâche, including 1964, 1962, 1957, 1956, 1947, 1942 and 1934. In particular, the wines from the sixties and the 1942 were superb. The Sotheby's sale comes on the heels of a sale this past June of the late Henri Jayer's personal wine cellar that set a new record for a single wine auction, realizing $34.7 million. My guess is that, as with the Jayer sale, the lots in this sale of Robert Drouhin's DRC collection will have fetched far more than their high estimates when the hammer falls.